The GIS division at the City of Nacogdoches gets data into the hands of the people who can make the most of it. The City of Nacogdoches, considered the oldest town in Texas, has significantly expanded its GIS program over the last seven years. 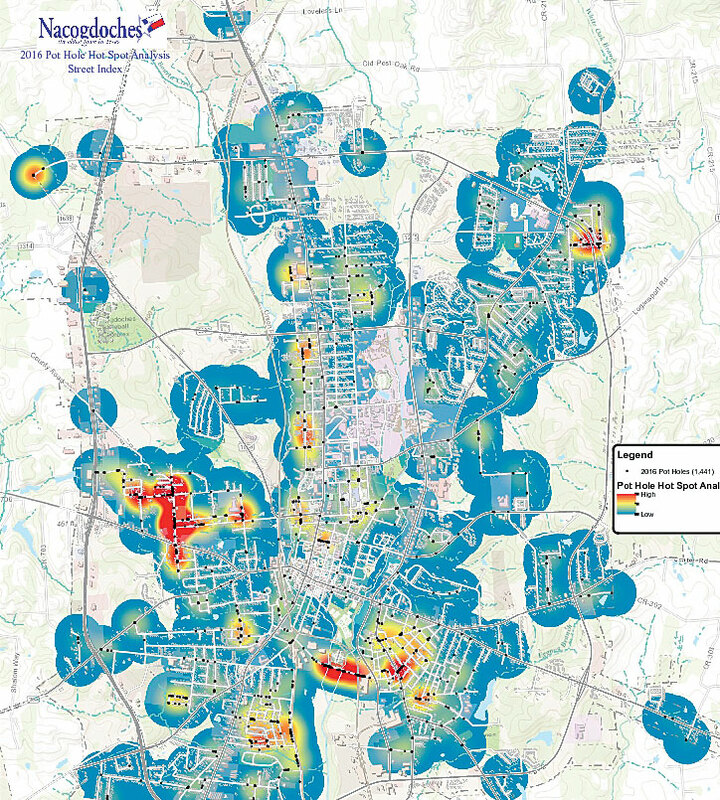 Smart devices coupled with mobile solutions from Esri—such as Workforce for ArcGIS, Collector for ArcGIS, and Survey123 for ArcGIS—have enabled the city’s engineering department/GIS division to get its data out in the field and into the hands of the people who can make the most of it. 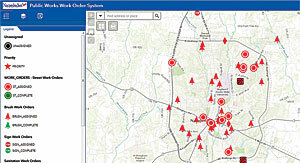 The public works department has become one of the city’s heaviest users of GIS. Tasked with a range of undertakings, from managing commercial dumpsters to issuing work orders for street, sanitation, and pothole maintenance, the department wanted to move away from sluggish, paper-based processes to app-centered workflows. Building on its already robust use of the ArcGIS platform, the GIS division made this digital transition easily and economically. 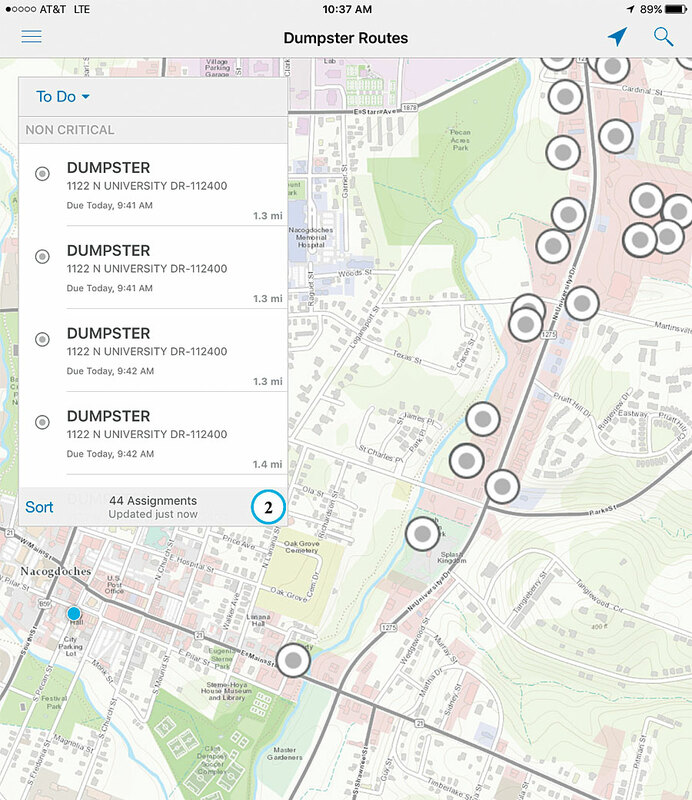 Workforce for ArcGIS automatically selects the dumpsters that need to be picked up on a given day and sequences the order in which they should be collected. For years, Nacogdoches’ public works department used a combination of different software packages, Microsoft Excel files, and handwritten notes to keep track of the dumpster, compactor, and open-top trash can pickups it was responsible for. Unsurprisingly, this muddled system led to inconsistencies between the pickup schedule and billing. To keep better track of the dumpsters and their collection timetables, public works manager Cary Walker asked the engineering department/GIS division to develop a system that would let the commercial front-load trash truck drivers know when and where dumpsters needed to be picked up each day. Walker also wanted to be able to see the drivers’ locations in real time so the department could dispatch them to extra dumpster pickups if they were in the area. To meet both needs, the GIS division chose to use Workforce for ArcGIS. 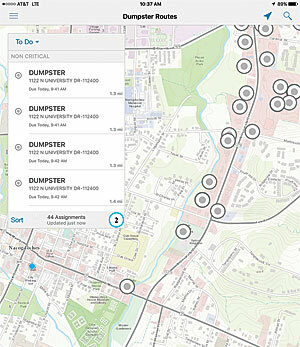 First, the GIS division needed to locate all the dumpsters, compactors, and open tops in Nacogdoches. Jose Olvera, the sanitation supervisor, used paper route sheets (which are just spreadsheets) of the drivers’ routes to find every single commercial dumpster and record its GPS coordinates, the collection point’s address, the building name, the dumpster’s size, the owner’s account number, the pickup days, and the order in which it was collected. Although this was the best way to gather all this information, it presented an additional challenge: each route sheet showed the dumpsters that were picked up on a specific day, so if a dumpster was picked up six days a week, the GPS coordinates were recorded six times. With help from the public works department’s office assistants, however, the GIS division was able to comb through the database to cross-reference the dumpster locations against billing statements and eliminate duplicate data. 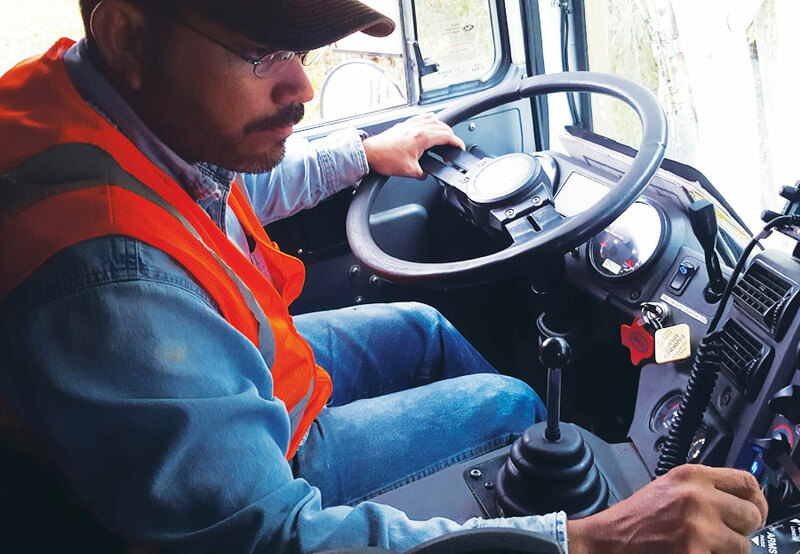 When commercial front-load drivers report for work each morning, they turn on their iPads and access Workforce to get their pickup assignments for the day. Once the dumpster database was complete, the GIS division automated the process of selecting the dumpsters, compactors, and open tops that had to be picked up on a given day; sequencing the order in which they needed to be collected; and uploading this information to Workforce. It did this by first creating Python scripts to extract each day’s routes from the database and put them into a CSV file and then uploaded the assignments to Workforce. Now, the scripts run each night and remove all the completed assignments before uploading the next day’s routes. When the commercial front-load drivers report for work the following morning, they turn on their iPads and access Workforce to find out their pickups for the day. In turn, the public works department’s office assistants use the app to monitor the drivers as they go about their collection routes. Immediately after Workforce was implemented, the public works department noticed that drivers were completing their routes faster and that the call volume from citizens with dumpster pickup issues had decreased. For 25 years, the public works department in Nacogdoches had used paper forms to issue work orders. The process was time-consuming. A paper work order had to be created and delivered to the person who was going to complete it. Then he or she had to bring it back to the office assistants when the work order was finished. In addition to streamlining this process, Walker wanted to be able to monitor when and where work orders were completed. Specifically, he wanted a customized app that could track requests to fix potholes, trim city-managed bushes and clean up leaves, repair and replace street signs, collect garbage, and fix or change out residential trash containers. Walker wanted each type of work order to have its own symbol so it would be easy to look at a map and instantly know what the work orders were for. He also wanted to maintain an archive of completed work orders for future reference. 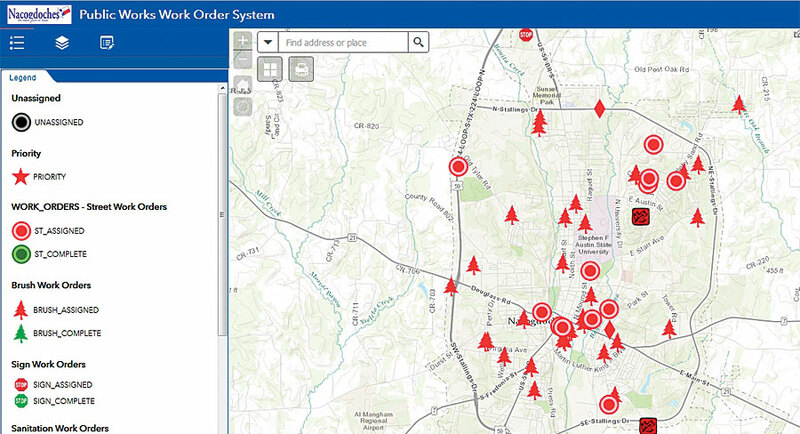 The public works office assistants use ArcGIS Online to assign work orders to field crews. The Nacogdoches engineering department/GIS division knew that Collector for ArcGIS would satisfy these requirements. Since maintenance was being done on the city’s main enterprise geodatabase, the GIS division began by creating a new enterprise geodatabase that contained dumpster accounts; warnings for dumpster drivers, such as low overhead power lines and trees; and current and archived work orders. The team also shared a map of addresses, streets, city utilities, rights of way, and work orders as a feature service. 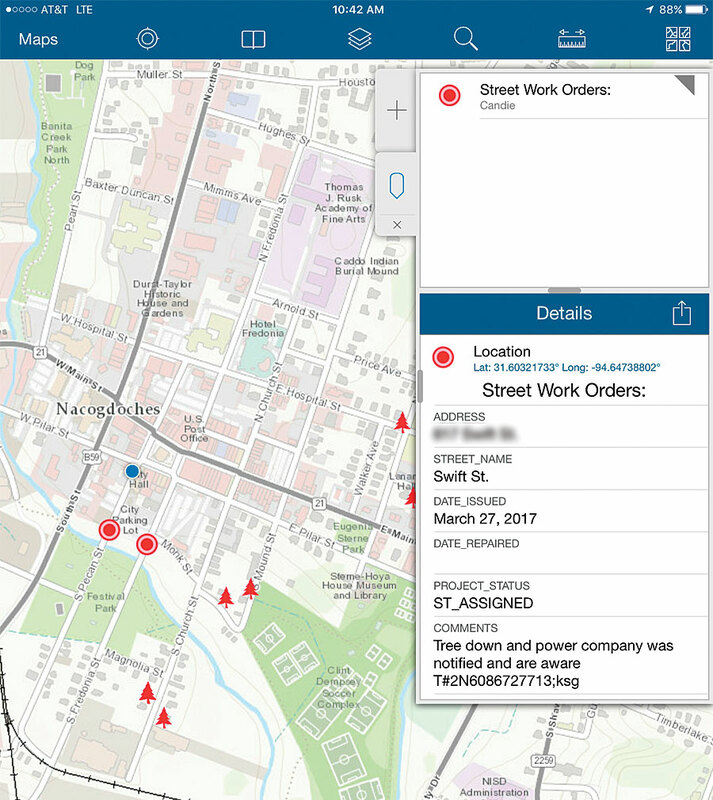 Using ArcGIS Online, the division then developed an app, called the Public Works Work Order System, that the office assistants could use to assign work orders to field crews. The app also allows other departments within the city to submit work orders. After tracking pothole locations for a full year, the City of Nacogdoches easily verified the streets that needed to be repaired. 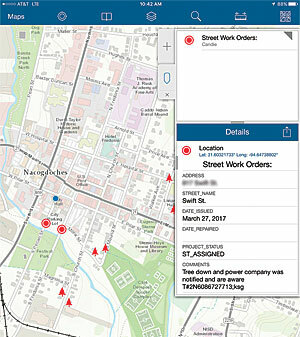 With Collector for ArcGIS, crew members out in the field can see when they get assigned a new work order. Using Collector on their iPads, crew members out in the field can see when they get assigned a new work order and, if possible, head straight to the issue to fix it. Once a crew member marks a work order as complete, Collector archives it so it is accessible via the Public Works Work Order System app. Since the public works department integrated Collector with the Public Works Work Order System app a year and a half ago, the City of Nacogdoches has reaped quite a few benefits. Work orders are easier to track, and field crews are more efficient by knowing where their work orders are located and who they will be doing a job with. Additionally, by tracking pothole locations for a full year, the city was able to easily verify which streets needed to be repaired. It is currently tracking storm drain repairs as well to determine which ones will need to be replaced soon. 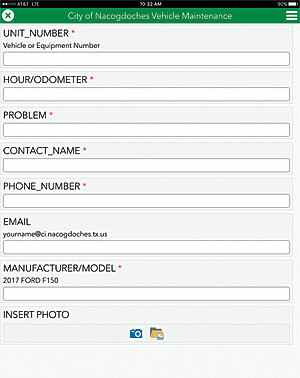 With Survey123 for ArcGIS, the GIS division built a survey that contained only the fields needed to submit a work order for vehicle maintenance. To complete most of its work, the City of Nacogdoches’ public works department relies heavily on 10 trucks: 3 for collecting residential and commercial trash containers, 3 commercial dumpster sanitation trucks, 2 for picking up garbage from open-top dumpsters, 1 yard waste truck, and 1 for collecting brush. To ensure that the department keeps these trucks in good working order, Walker asked the engineering department/GIS division if it could develop a new work order system to track vehicle maintenance requests. While Walker’s request wasn’t specifically grounded in geography, the GIS division determined that Survey123 for ArcGIS would work well for this. The team sat down with members of the public works department and vehicle maintenance group to figure out exactly what they wanted to track. Using Survey123, the GIS division developed a simple survey that contained only fields that city personnel needed to see—such as the vehicle number, the problem, and the person’s contact information—to submit a work order to vehicle maintenance. 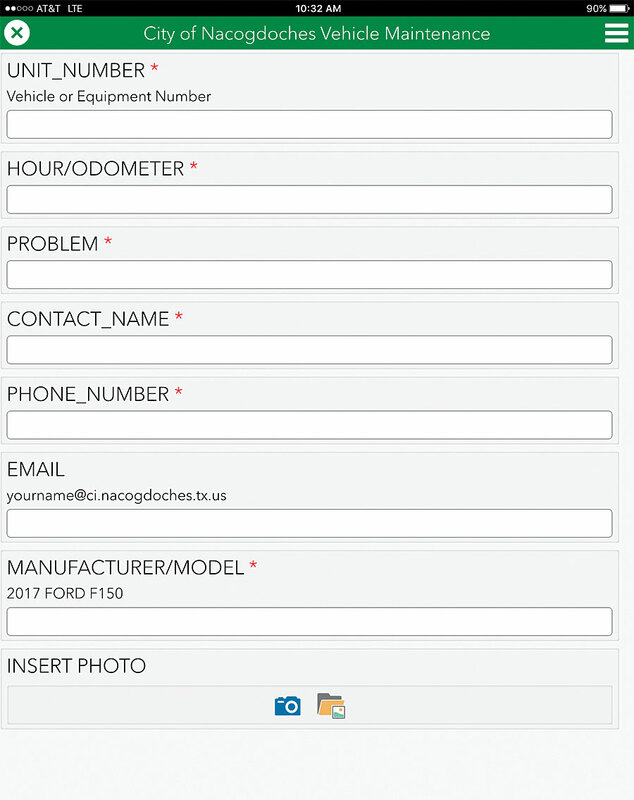 Then, using ArcGIS Online, the team added fields to the survey that only the vehicle maintenance department would be able to see, such as the manufacturer/model, the status of the repair, which parts were used, and how long the repair took. The system also keeps track of who creates a work order, as well as each update to that work order, so it is easy to see when a work order is submitted and when the repair is made. The team was also able to add fields to the back end of the survey that only the vehicle maintenance department could see and use. Now, personnel within the public works department—and throughout the City of Nacogdoches—can submit vehicle maintenance work orders using Survey123. The vehicle maintenance department can easily view and edit these work orders by logging in to ArcGIS Online and looking at the vehicle maintenance feature layer Data tab. Finally, city staff members no longer have to leave notes on their windshields requesting repairs or wonder why their vehicle is taking so long to fix. 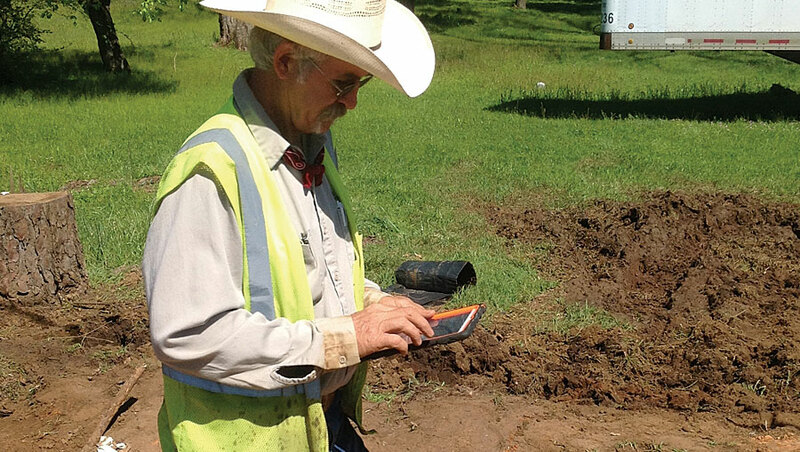 Giving employees in the public works department such wide-ranging access to enterprise GIS—especially via apps they can use in the field—has been a boon for the City of Nacogdoches. “These applications have saved the city from purchasing outside software packages and have saved time and money on a daily operational basis,” said Steve Bartlett, a city engineer. For more information on how the City of Nacogdoches uses GIS—in the public works department and beyond—email Tred Riggs, the city’s engineering technician supervisor, or call 936-559-2519.